We were commissioned to begin design work on a new Passivhaus in January 2014. The clients brief was for us to design a high quality home for comfortable, low cost living. The site was located on a next door garden plot, the neighbouring cottages forming the edge of Garway Common. From an early stage we liaised closely with the local authority planning department to explore design and material options to integrate a new house into the context of the immediate surroundings of the existing village of Garway. Working with the main contractor in the planning phase we developed a scheme and detail design package which would be cost effective and buildable to passivhaus standards and to a tight budget and delivery programme. Living, cooking, eating and sleeping spaces have been designed to flooded with daylight whilst avoiding overheating. With rigorous attention to detail the task of making the external shell airtight became a straightforward task for the contractor. By making the fabric as airtight as possible means energy loss is reduced significantly. Airtightness is tested at the completion of the building shell. 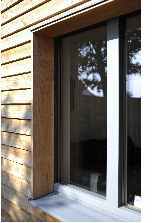 Controlled ventilation is provided with the use of a whole house ventilation system with heat recovery. 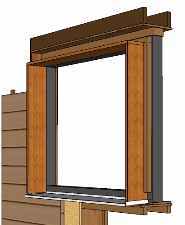 Heat energy is extracted from the kitchen and bathroom areas and recovered to warm up incoming external air. 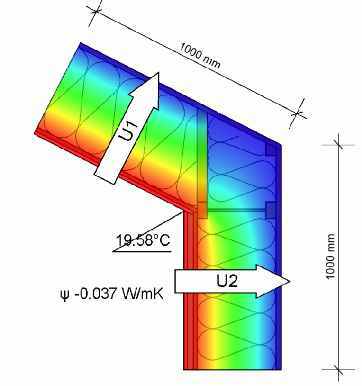 Throughout the design process we analyse and adjust the detail and design of the house with the use of specialist thermal analysis computer software to monitor overall energy performance and key details such as wall/roof junctions. 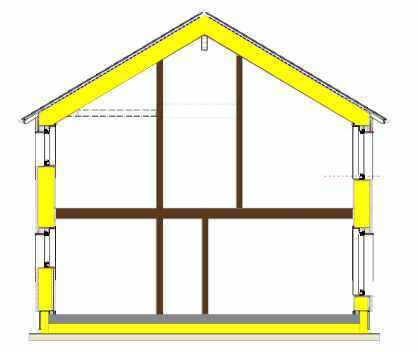 Wrap around insulation(yellow hatch) within the building fabric and under the slab - similar to a tea cosy. Careful attention is made to ensure air tightness and wind tightness layers are pre planned at the detail stage.